Can a VA Loan Be Passed to a Spouse or Children? While the majority of servicemembers and veterans are eligible for a VA home Loan, what are the requirements for spouses or even children? When looking into the VA Loan eligibilty there are always some exceptions as well as unique circumstances for each veteran. The only way borrowers and VA lenders can be sure about eligibility is by obtaining a veteran’s Certificate of Eligibility or COE. This doesn’t necessarily need to be the first step in the process but by obtaining the COE this becomes especially critical for any military spouses that are left behind. Unremarried spouse of a Veteran who died while in service or from a service connected disability, you are a spouse of a servicemember who is missing in action or a prisoner of war. Surviving spouses of certain totally disabled veterans whose disability may not have been the cause of their death. 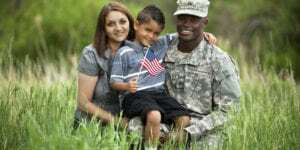 Unfortunately, VA home loan benefits do not extend to the children of veterans. There has not been much of an incentive to change this however, there may be new laws in the future that will give eligibility to children. Any prospective buyers can always check with their state or county housing officials to see if there are any localized programs that will provide benefits to children of deceased veterans. Sometimes VA benefits can seem a bit confusing. It is always best to consult your Loan Originator to get more details about how you can take advantage of your VA home loan.